Ho, Coote and Easton treat us to an amino acid inversion in a recent JORG article (DOI). The authors have been careful to hide the relevance of the research presented but this blog as a rule takes a leisurely approach towards academic research. Less admirable, the authors also hide some key experimental details. The challenge: how to convert natural N-methylated alanine into the opposite enantiomer? The solution: a chiral auxiliary and subtle proton acidity manipulation. 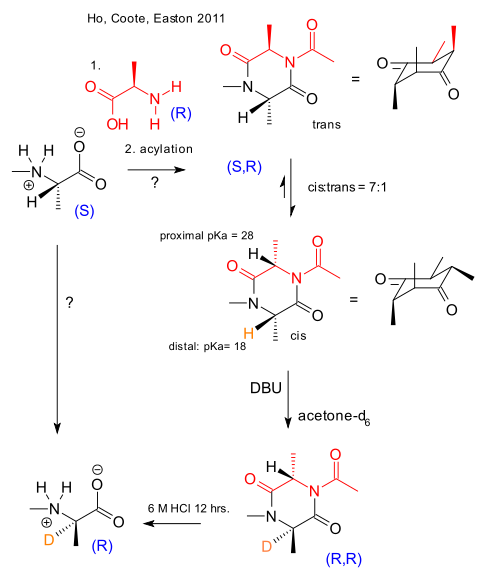 Step 1 consisted of reaction of the alanine with unnatural (R) alanine to the (R,S) cyclic dipeptide (a deketopiperazide) followed by acylation. The nature of the substituents on both reaction partners was found to have a great impact on the cis-trans ratio. For methyl groups this ratio is 7 and computational work confirms this originates from unfavorable keto and N-alkyl 1,2 interactions in the trans isomers. When the substituents get bigger 1,4-steric effects take the upper hand and the trans isomer dominates. Step 2 was epimerization with deuterated acetone and DBU through the enolate. This method will only work if the so-called distal proton is much more acidic than the proximate proton on the other side and this is exactly why the piperazine was acylated in the first place. This acyl group makes the neighboring proton less acidic by a 10 computed orders of magnitude via a mix of resonance and inductive effect. After deuteration the cis isomer was isolated by column chromatography and the inverted amino acid liberated by acid hydrolysis. Note that regular alanine is not acidic enough to exchange protons with acetone and even then the reaction product would be a racemate only. It is a pity that experimental data appear to be missing. It the least it makes reading and understanding the article a more difficult task it already is. This dipeptide synthesis was performed by a company based in Shanghai that is in the business of making and selling peptides. They are the first to profit from this type of research. Judging from the acknowledgments the research is sponsered by only the Australian taxpayer. The Journal of Organic Chemistry does not mandate author disclosures.